Examples, solutions, videos, and worksheets to help Grade 5 students learn how to divide decimals by powers of 10. When multiplying by powers of 10, we move the decimal to the right for each power of ten. 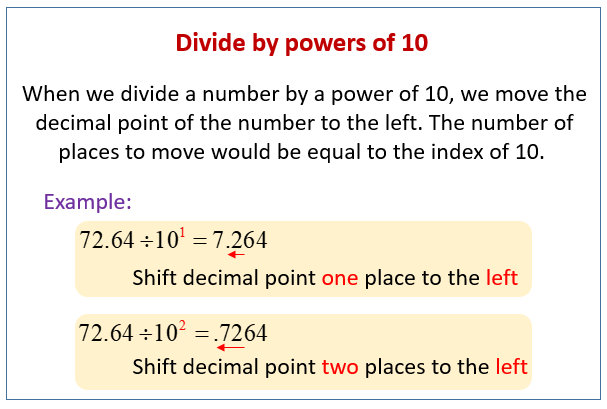 When dividing by powers of 10, we move the decimal to the left for each power of ten. The following diagram shows how to divide a decimal by powers of 10. Scroll down the page for more examples and solutions. This video explains how to divide whole numbers and decimals by powers of ten. A little shortcut when it comes to multiplying and dividing decimal number by powers of 10.